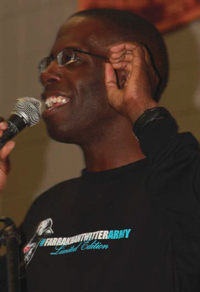 Jesse Muhammad said tweets from Minister Farrakhan inspired many all over the world, and hearing from the Minister actually saved someone’s life. During “Farrakhan Fridays” on Facebook, Minister Farrakhan responded to a woman’s question regarding why her prayers have not been answered. Unbeknownst to those reading, she was contemplating suicide. However, after the reply given by the Minister, she chose life. A few special guests came to show their support at the Tweet Up, including Ishmael Muhammad, the student national assistant to Minister Farrakhan. 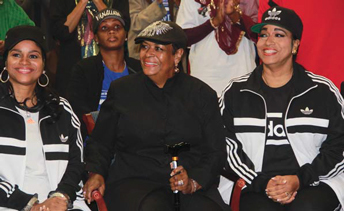 A very special surprise appearance was made by the Nation Of Islam’s First Lady, Mother Khadijah Farrakhan and her daughters. Mother Evelyn Muhammad, wife of the Most Honorable Elijah Muhammad and their daughter Marie Muhammad were also present. 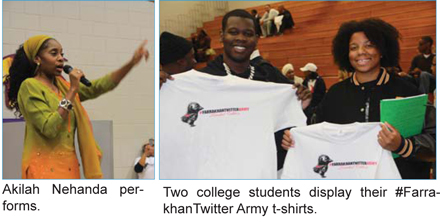 The program was emceed by two members of the Farrakhan Twitter Army, Artiium Muhammad from Miami and Halima Mahmoud of New Jersey. There were live musical performances by Jasiri X, also known as “the Peoples MC,” Wazeer the Great and Nehanda, which took them into Part 41 of “The Time and What Must Be Done” webcast at NOI.org/thetime. At that moment, there was just about standing room only in the high school gymnasium. The crowd was mixed with high school and college students, adults and guests visiting from various cities. Once the viewing began, the lights were turned down and the gymnasium was illuminated by laptops, smartphones and tablets. At different points, the Minister’s words inspired thunderous applauds, witness bearing and standing ovations. It was determined minutes into the broadcast that the hashtag #TheTime was trending nationally, for the 24th consecutive week. 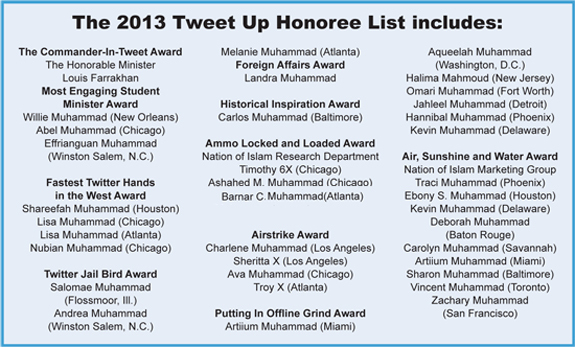 After the webcast, Farrakhan Twitter Army honorees were announced along with awards for their work. 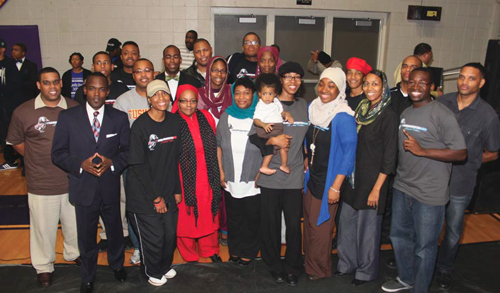 After the program closed out, many members of the Farrakhan Twitter Army gathered to take photos and socialize for the very first time, face to face. “Seeing the believers, non-believers and students Tweet today was absolutely amazing. I couldn’t be more proud to see my people listen to the words of the Honorable Minister Louis Farrakhan and Tweeting it. I’m in college, and I’m influencing others who are also in college and they are doing the same thing,” said Rasheedah Muhammad, a Prairie View A&M University college student at the Tweet Up.